The xMatters web user interface makes it easy to create, modify, and organize the devices xMatters uses to contact you. Devices include voice and text phones, email addresses, pagers, mobile apps and more. You can configure when xMatters contacts each of your devices, enabling you to receive notifications on the most appropriate device according to your schedule. You can also configure the device order and setting delays between devices to ensure that you have time to respond to a notification on one device before xMatters notifies the next device. By combining these features you can minimize notifications to disruptive devices while ensuring that you don't miss important events. Some organizations synchronize device data with external systems such as an HR database. If your organization does this, you may need to update your device information in the external system so it is not overwritten by the data synchronization process. The following sections describe how to add, remove, test, and deactivate your devices. The devices page displays a summary of your device contact information and the device timeline. For more information about working with the device timeline, see Configure device delays. In the drop-down menu, click Devices. xMatters displays your device timeline. Companies are configured with a predefined set of allowed devices. A company could be configured to allow Home Phone, Work Phone, Mobile Phone, Home Email, and Work Email devices. You can add one device of each allowed device type. Click your user name at the top-right corner of the page. In the drop-down menu, click Devices. On the Devices page, click Add Device, and then select the type of device you want to add from the drop-down menu. There are also convenient shortcut links directly on the Devices page that you can use to add devices without going to the Add Device menu. The device is added to the end of the device timeline. For the mobile app, follow the on-screen instructions to install the xMatters mobile app on your smart phone (push device). For more information about installing the mobile app, see Get the xMatters mobile app. Click the device name drop-down and select the device name, for example, "Work Email". The drop-down list does not appear if there are no other available device names. Enter the required contact information for your device such as the email address or phone number. Once you have added a device, you can configure advanced options such as whether it is active, the priority of notifications that are delivered to the device, the timeframes that xMatters may contact the device, and whether it is a failsafe device. For more information about configuring advanced settings, see Customize how xMatters contacts you. Removing a device permanently deletes it from xMatters. If you want to temporarily suspend a device, you can deactivate it. For more information about deactivating devices, see Activate or deactivate a device. Click the Remove Device button (the X at the far right of a device row). You may be unable to delete devices that are externally owned. Contact your internal xMatters representative to find out how to delete externally owned devices. After you have configured a device it is recommended to test it so that you know it is able to receive xMatters notifications. When you test a device, xMatters sends a notification to it. Responding to this notification causes xMatters to automatically mark the device as tested. Alternatively, you can manually mark a device as tested if you do not want to send a test notification to it. If your device does not receive the test notification it may not be able to receive other xMatters notifications. In this case, review the device settings and ensure you have entered correct contact information such as email addresses and phone numbers. User supervisors can search for users with untested devices and follow up with them to ensure that they can receive notifications. For more information about viewing users with untested devices, see Search user status with filters. Locate the device and click Not Tested drop-down menu next to it. From the drop-down menu, click Send Test Message to send a test message to the device, or click Mark as Tested to mark the device as tested without sending a message. If you receive a test notification on your device, respond to it. xMatters then marks the device as tested. You can only test active devices. You can activate a device from its Options menu. You can mark a device as inactive to temporarily suspend notifications to it without removing it from xMatters. Locate the device and click the Options drop down menu next to it. Use the Active/Inactive toggle to set the new device status. Click the screen to clear the Options dialog, and then click Save Changes. An inefficient device is any device that xMatters is consistently and repeatedly unable to contact. For example, an SMS device might not work because someone accidentally transposed two numbers when entering a phone number. Another device might simply be out-dated because a user got a new phone number and never updated their settings. If xMatters is trying to send you a high-priority notification and can't complete a call to your phone, you're not being notified as quickly as you should. These repeated attempts also put a strain on available resources, and raise the costs of the service. If xMatters is unable to successfully contact a device 100 times in the same week, the device will be deactivated. A failure only counts towards this limit if all attempts to connect to the device are unsuccessful; if an attempt is initially unsuccessful but the same notification succeeds on a retry attempt, it is not considered a failure. The device information will stay in the owner's user profile but the device will be marked as "Inactive" and xMatters will not attempt to call it again. If the user who owns the voice device has any email devices, they will receive an email explaining the problem. The user can then log into xMatters and update or double-check their settings. If everything checks out, they can reactivate their phone and make a test notification to ensure that notifications can now get through. Automatic deactivation is currently enabled for SMS devices only. The following sections describe how to refine device notification settings so that you receive notifications on the most appropriate device according to your schedule, the importance of the notification, and how long xMatters has been attempting to contact you. If a device is targeted directly, such as when a device is a member of a group or if you add a device as a direct recipient of a message, xMatters ignores any configured timeframes, priority settings, and delays, and sends the notification to the device immediately. You can adjust when xMatters notifies each device so that you receive notifications on the most appropriate device according to your schedule. You could configure your work phone to be active during working hours, your mobile phone to be active until 10 PM, and your work email to always be active. 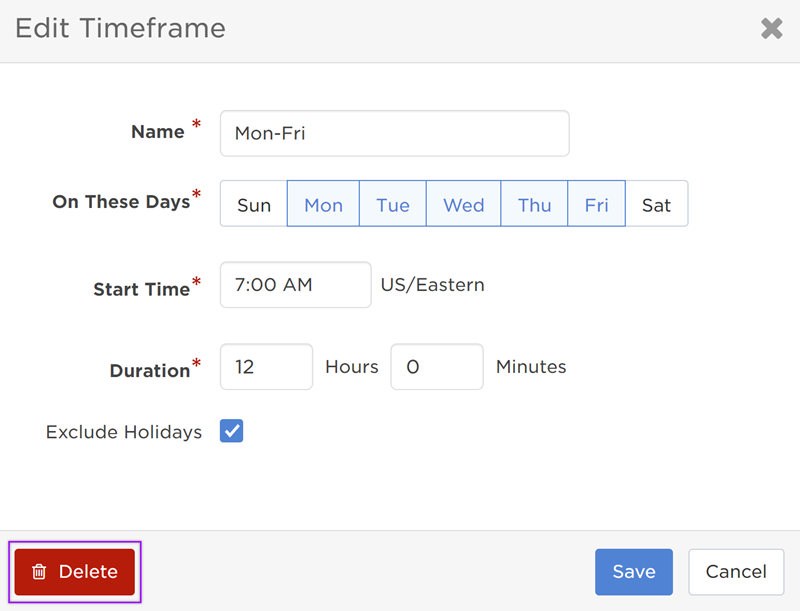 To add a new timeframe, click Add Timeframe to open the Add Timeframe dialog box. To edit an existing timeframe, click the Name of the timeframe you want to edit. The Edit Timeframe dialog box appears. 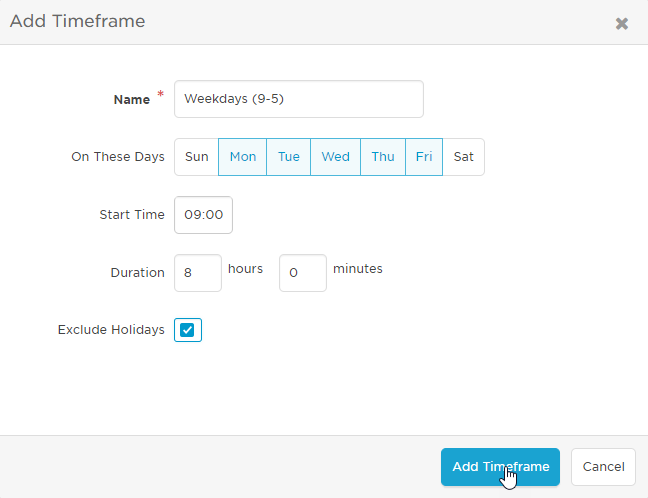 Type a descriptive name for the timeframe in the Name area, for example, type "Weekdays (9-5)". Use the On These Days selector to choose the days of the week that the device may be contacted, for example, select Mon Tue Wed Thu Fri. In the Start Time area, type the time the device may begin receiving notifications; for example, type 09:00 to start receiving notifications on this device at 9 AM. In the Duration area, type the number of hours and minutes after the start time that the device may receive notifications. To prevent your device from being contacted on holidays, select Exclude Holidays. To delete a timeframe, click the X next to the next to the name of the timeframe. You can configure device delays to allow you to have some time to respond to a notification on one device before the notification is delivered to the next device. This gives you an opportunity to handle a notification on a less-disruptive device such as email before xMatters notifies a more-disruptive device such as a mobile phone. If you do not configure device delays you may receive notifications on multiple devices at the same time. To configure xMatters to wait for you to respond on one device before notifying another device, add a device delay to the timeline. Device delays may occur between any two devices. You cannot add device delays at the start or end of the device timeline. When you belong to a group that uses escalations delays, ensure that you do not configure your device delays to be longer than the group's escalation delays. If your device delays are too long then a notification could escalate to the next group member before you have received it on all of your devices. If the devices are not already in the order that you want to be contacted, reorder them by grabbing the drag handles and dragging them to a new position in the list. To add a wait time between devices, click the clock icon that appears on the device timeline in between the two devices. Type in the number of minutes for xMatters to wait before notifying the next device in the list. The timeline now displays the elapsed time that will have passed before each device is notified. Repeat this process to add additional waits between other devices in your device timeline. To remove a delay, click the Remove Wait button (the X button) at the right side of your delay entry in the device timeline. You can drag and drop delays to new positions within the list. You can configure a device to only accept notifications for higher-priority events. xMatters only notifies devices when the priority of an event is equal to or higher than the device priority threshold. You may want to configure your personal mobile phone to only accept high-priority notifications and configure your work email to receive all notifications regardless of priority. To receive only high-prioirty events on this device, select High priority events only. To receive high and medium-priority events on this device, select Medium and higher priority events. To receive all events on this device, select All Events. Click outside of the options dialog to return to the main page, and click Save Changes. xMatters contacts failsafe devices in some situations when you do not have any other devices that are configured to receive notifications. When you set a device to be failsafe, you may receive notifications on the device outside of its active timeframes. This happens when a notification is sent to a group you belong to that is configured to use failsafe devices, and you do not have any other devices with an active timeframe. The failsafe setting does not apply when you are targeted directly by a notification or if the group is not configured to use failsafe devices. Select the Set as failsafe device check box. The following sections describe some advanced configuration settings for devices. Pager devices can be classified as one-way pagers or two-way pagers. One-way pagers can receive notifications but cannot respond to them. Two-way pagers are able to receive notifications and send responses back to xMatters. If your pager is a two-way pager, enable two-way communication so that xMatters includes response options in the pager message. You can then respond to xMatters notifications directly from your pager. If your pager is a one-way pager, disable two-way communication so that xMatters does not include response options in pager messages. You can then respond to notifications by calling in to xMatters or logging on to the xMatters user interface. Locate the device and click the Options drop-down menu next to it. If your pager is a two-way pager, select Enable two-way communication. xMatters then includes response options in the pager message body. If your pager is a one-way pager, deselect Enable two-way communication. xMatters then does not include response options in the pager message body. Some systems are configured to use more than one device provider to communicate with devices. Different device providers may support different features, so you may have to select a specific provider to access the corresponding features they support. Most of the time you do not need to change the default device provider. Your system administrator can help you decide if you need to use an alternate provider. If your system has more than one device provider, the Provider drop-down list is displayed. Select the appropriate device provider. A device icon displays a lock badge when it is managed by an external system and one or more of its fields cannot be edited in xMatters. To change the value of a locked field, you must first update it in the external system. xMatters will then update this value the next time the data synchronization process occurs. The process for updating your contact information in an external system is unique to each organization but typically involves updating a system such as an HR database or LDAP server. Contact your internal xMatters representative to find out how to best update locked fields.